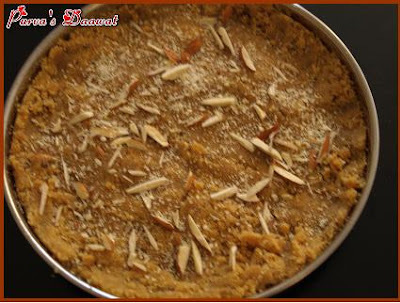 Sukhadi is a traditional Gujarati dessert. Sukhadi is known as Godpapdi or Gurpapdi in Maharashtra. 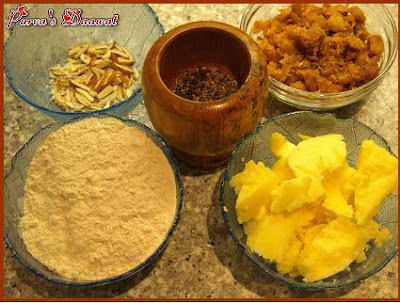 Sukhadi is prepared in every Gujarati house during any religious / festival occassions. In Mahudi Jain Temple at Mehsana, Gujarat, Sukhadi is offered as a prasad. 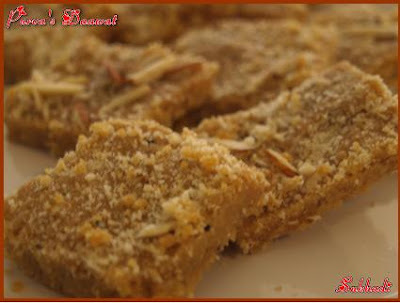 Sukhadi is made up of wheat flour and gud / gurr hence it is known as godpapdi / gudpapdi in Maharashtra. My mother always made Sukhadi during Rakshabandhan for us, so I thought let me continue the tradition of making Sukhadi on Rakshabandhan. 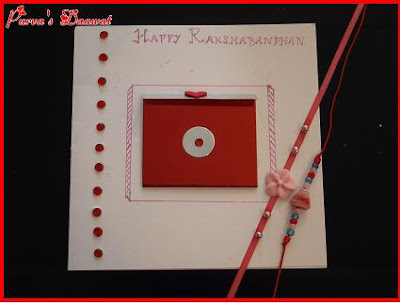 Rakshabandhan or Rakhi is a special emotional Hindu Festival between brother and sister. ''Raksha'' means protection, ''bandhan'' means bound or binding.This is celebrated by tying a 'rakhi' or a 'holy thread' on the brother's wrist by the sister and both pray for each others' well being followed by a promise from the brother to take care of his sister under all circumstances and the brother has to give a gift to his sister in return. In many traditions Rakhi is not only tied by sister to brothers, but they are even tied to bhabhis (Sister in law) in a form of a ''Lumbha''. Rakshabandhan is celebrated with great enthusiasm and zeal. The strong bond represented by Rakhi has resulted in innumerable political ties among kingdoms and princely states. The pages of Indian history testify that the Rajput and Maratha queens have sent Rakhis even to Mughal kings who, despite their differences, have assuaged their Rakhi-sisters by offering help and protection at critical moments and honoured the fraternal bond. Even matrimonial alliances have been established between kingdoms through the exchange of Rakhis. History has it that the great Hindu King Porus refrained from striking Alexander, the Great because the latter's wife had approached Alexander and tied a Rakhi on his hand, prior to the battle, urging him not to hurt her husband. The ritual is observed on the full moon day of the Hindu month of Shravan. It is also known as Nariyali / Narali Purnima. In South India, Raksha Bandhan is called Avani Avittam, when the sacred thread is ceremoniously changed. I am the only girl child in my family and surrounded by brothers. Rakhi has always being close to my heart as all my cousin brothers, uncles and aunts visit my place. We being Gujarati brahmins, early in the morning my father, uncles and my brothers change their Janoi / Janai ~ Sacred Thread by chanting Gayatri Mantra. Then after regular pooja I tie Rakhi, send by my Bua (Aunt) to my father and uncles. Then comes the turn of my brothers. First I tie Rakhi to my real younger brother, the ritual is to apply a kumkum tilak on his forehead, then tie Rakhi on his wrists, and then lit the diya and pray for his well being and then offer him yummy Sukhadi, prepared by my mother to eat. Then, I tie Rakhi to my other cousins and in return they all give me gift. Since its not a public holiday on that day, we go to respective work, school and colleges and at night we enjoy delicious feast prepared by my mother and my aunts. My brother wears Rakhi for the entire year and changes only on the next Rakshabandhan. Last year I had unique Rakhshabandhan, I got engaged and my hubby was in UK and me in India. At my hubby's place they have a similar tradition, all of them meet up on this day. My sister in laws, in absence of my hubby invited me. They all tied me Rakhi / Lumbha on my wrists and my hand was full of colourful Lumbhas. This is the first Rakhshabandhan, I am away from my house, and I am missing my brother a lot. This time I made Rakhi by myself along with a simple greeting card. One Rakhi I made with beads used for making jewellary and the other Rakhi is an edible one. I have used materials used for decorating cakes. I have made a simple Rakhi as my brother wears it for the whole year. 2. Now add wheat flour and roast the flour till it turns golden brown on a low flame. 3. When it turns golden brown, add grated gud, cardamom powder and nutmeg powder. 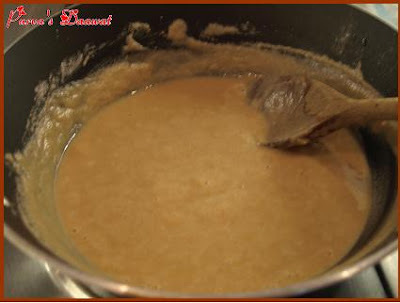 Let the gud melt by mixing it well with the wheat flour by adding very little milk on a very low flame or by removing the vessel from the gas. 4. Grease a steel thali with ghee, when the gud is melted transfer the hot wheat batter on the greased thali and spread the batter evenly on the thali. 5. Sprinkle khus khus and finely chopped nuts on the batter and cut the batter in a diamond shape. 6. Let the batter cool and then remove the diamonds and serve. Lovely dear...nice writeup and detail method of making Sukhadi...I'll try soon...this all reminds me my school days..love the Lumbha too..my frds use to tie to me ;)..missing all tht :(..and Rakhi is so elegant and beautiful..ur bro sure going to love this...Happy Rakhi..enjoy the day. Have a very happy Rakshabandhan purva, the sweet looks very rich. Something new and looks awesome. Gonna try it soon. Happy Rakhi to u. Looks really yummy purva. posting the beautiful award u passed me on the blog. sorry about the delay. was a little vexed due to dealing with someone poaching and plagiarising a community I run on a social networking site. Sukhadi looks delicious..This is a very new dish to me..thanks for the wonderful recipe.. Happy Rakshabandhan to all you friends..
aahh.. another interesting recipe blog.. 1st time here.. u have a gud collection of recipes..
beautiful post..sukadi has come out really nice..and how sweet of you to make a rakhi ..your brother will be so glad!! Wow! Nice post about Raksha bandan.Your Rakhis looks very nice.Sukhadi is quiet new to me...looks yummy &delicious.Happy Rakshabandhan to you & to your family.. I love this sweet! We also make it in Karnataka under the name of gulpavate and we use wheat dalia for making it against wheat flour used in your recipe. I simply adore this! Nice post...Cute that you could make the Rakhis urself for them. Godpapdi...have tried this once. It tastes realy gud! hi Purva, such a lovely sweet and a great post. I will try to make this myself for sure. Have bookmarked this:-) Nice that you made the card yourself. Oh mane ane hubby ne pan godpapdi sakhat bhave chhe, awesome entry dear!!! 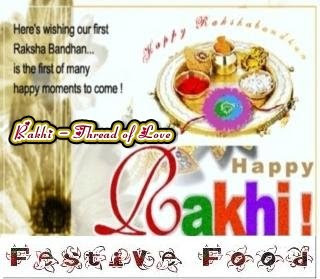 Hi purva what a lovely post about rakhi, its been a couple of years now since I've celebrated rakhi. but yes! childhood memories are ones to treasure. dear..have sent my entry to priti.. I don't think I have been here before but I think your daawat is ekdum khaas! Nice recipe - I love this when my friends bring it to office - yet to try! Hey Purva, this is my first time in ur blog. Very beautiful I must say! Sukhadi looks amazing... I am south Indian, and am hearing about it for the first time. I will try it when I have guests over. I LOVE this barfi! I have bookmarked it to try. Thanks a lot for sharing the recipe.